You reported the symptoms like light-headedness, tiredness, fainting spells, and shortness of breath. Doctors after examination found that it was because of slower heart beats that result in inadequate supply of oxygen to your body and brain. They decided to implant an artificial cardiac pacemaker in your body to supplement the heart's natural rhythm. Doctors have implanted an artificial cardiac pacemaker in your body which is a small battery-operated device having a pulse generator, which is connected to the heart by one or more pacing leads or wires. The typical hospital stay for artificial cardiac pacemaker implantation is between one to two days. The pulse generators were implanted under the skin just below your collarbone on the left side. The leads were inserted using x-ray control, via a vein found in this area, and positioned in the appropriate right-sided heart chamber. Fig.1. 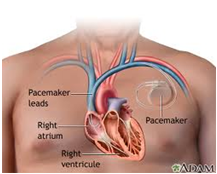 Diagram of an artificial pacemaker implanted. - Use home appliances but avoid close and prolonged proximity. - Notify security staff if you have a pacemaker. - Let all of your doctors, dentists, radiologists, MRI and other radiology scan technicians know that you have a pacemaker. - Avoid close or prolonged contact with electronics, electrical devices or devices that have strong magnetic fields like mobile phone, MP3 players, metal detectors, industrial welders. - Do not put your mobile phone or MP3 player in your shirt pocket. Call your doctor if you feel any kind of discomfort during your recovery. For a few days to weeks after surgery, you may have pain, swelling, or tenderness in the area where your pacemaker was placed. Talk to your doctor before taking any pain medicines. Your doctor may ask you to avoid vigorous activities and heavy lifting for about a month after pacemaker surgery. Most people return to their normal activities within a few days of having the surgery. - Your wound looks infected (redness, increased drainage, swelling, painful). - You are having the symptoms you had before the pacemaker was implanted. - You feel dizzy or short of breath. - You have chest pain. - You have hiccups that do not go away. - You were unconscious for a moment. In most cases, having a pacemaker won't limit you from doing sports and exercise, including strenuous activities. You may need to avoid full-contact sports, such as football. Such contact could damage your pacemaker or shake loose the wires in your heart. Ask your doctor how much and what kinds of physical activity are safe for you. Tobacco and Smoking(causes 10% of cardiovascular deaths) Quit! Alcohol is high in calories and known to increase blood pressure. Talk to your doctor to know more about how much alcohol can be consumed, post-surgery. Stress Stress can increase blood pressure which can lead to other complications. Reduce stress levels. Incorporate a relaxing routine chant, read a book or meditate. Social Support Find a friend to help you cope with the feelings of anxiety, anger, depression etc. Caffeine For a good sleep, reduce the intake of tea, coffee, colas and chocolate. Maintain an Ideal Weight, Blood Sugar and Blood Pressure. Follow a balanced diet and prudent lifestyle. Aim to keep your weight below Body Mass Index (BMI) of 23. To calculate go here. For a speedy and long lasting recovery - combine positive dietary and lifestyle changes with the medical care. Poor appetite - consume small portions of food, about 7-9 meals a day. Nausea -take the prescribed medicines on full stomach. 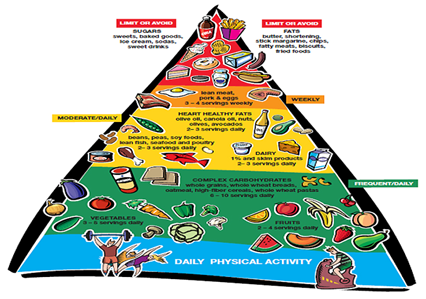 Food items can be classified into six major groups as shown in the Healthy Heart pyramid. 1. Include lots of fresh, seasonal, local and if possible organic Fruits and Vegetables. 2. Add plenty of Whole Grains (whole wheat flour, brown rice, whole beans). 3. Choose foods high in Good Fat such as olive oil, peanut oil, fatty fish, walnuts, flaxseeds. Say NO to all Sugary and Refined foods (cakes, pastries) and do not add any sugar to beverages. Avoid Unhealthy Fats such as Cholesterol, Saturated and Trans Fat. Stay away from egg yolks, cream, butter, ghee, coconut, deep fried items, whole milk, dalda, vanspati. No Carbonated, Caffeinated and Alcoholic beverages. Curb Salt intake, as it can increase blood pressure. Don't add salt while cooking and reduce packaged food consumption. Include food sources rich in Magnesium and Potassium to increase heart health. Check portion sizes for each food by going to these links. Talk to you doctor about any fluid restrictions. Do not add SALT or SUGAR while cooking or as seasoning. For cooking, use only Olive oil or Peanut oil. It is never too late to adapt a healthy lifestyle. Maintain a balanced diet and perform regular physical activity. Eat foods that are low in saturated fats and cholesterol. Avoid foods high sodium content. If overweight or obese, loose the extra kilos and maintain a healthy weight. Quit smoking and cut down on alcohol. Check your blood pressure and blood glucose regularly. Eat Right and Exercise your way to a Healthy Heart.